It’s that time you have all been waiting for… it’s Volvo’s Biggest Fan of the BIG EAST challenge post time! For the fifth topic of this season long contest, Volvo has tasked the 16 contestants with identifying the best traditions for our alma maters. First off, St. John’s is one of the few BIG EAST schools to be lucky enough to have two home venues: Carnesecca Arena and Madison Square Garden. The history behind both the arena formerly know as “Alumni Hall” and the “World’s Most Famous Arena” or the “Mecca of College Basketball” is undeniable. The on-campus Queens venue had to be renamed because of the accomplishments that former head coach and STJ “Legacy” Lou Carnesecca led the program to, while the annual BIG EAST Championship is held at the Red Storm’s “other” home venue. Now my experience at St. John’s is an interesting one. I may have attended just three games as an actual fan because of my major and interest in working in athletics as both a Sports Management major at STJ and working for the athletic department since my first day on campus, I rarely experienced a game from a fans point of view. 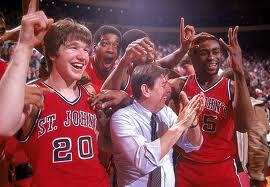 Not that it took away from my love of St. John’s basketball at all. I began working for the Red/White Club, which put on dinners prior to each home game for alumni. From my perspective, I was able to see every home game for free. I was not able to be in the student section, but I was there, taking it all in. My traditions became heading to the arena an hour early to set up for some of the most dedicated alumni that St. John’s has ever had. Some of the most memerable moments that I can remember are former head coaches Mike Jarvis and Norm Roberts coming into the dinners pregame to talk to the alumni about that evenings game and what the team would focus on. In-game, I was able to get closer to the court than most undergrads could dream of. I was often given a press pass, where I would stand in the Garden tunnel and be near-mesmerized as opposing players such as Emeka Okafor and Ben Gordon would walk by or legendary coaches like Jim Boeheim or Rick Pitino would ask me to please move as they made their way to the their respective locker rooms. Now while my undergraduate and post-grad experience may be much different than most, it should not take away from some of the great traditions (new and old) that St. John’s has. One of the new traditions at St. John’s is the annual “Black-Out Game.” Fans receive black STJ Basketball t-shirts while the Red Storm come out in their alternate black uniforms, which have become a huge hit for players and fans alike. 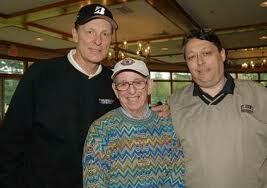 One of the greatest things about going to a St. John’s game is a chance to meet living legends. Two games that I will always remember were the times where I got to talk to Coach Carnesecca prior to the start of the matchup. Coach would often walk through the lobby talking to any and everyone, always with a kind word and an excellent story as you stood awe-struck in front of him. 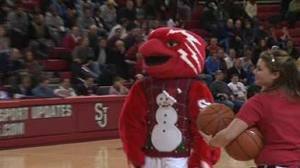 Thanks to “Lou’s” unforgettable style, one other new staple of any St. John’s season is “Ugly Sweater Night.” Every year, around the holiday season, fans and even the mascot are encouraged to wear their most hideous sweaters, not only to celebrate Christmas/Hanukkah/Kwanza and the like, but to celebrate the career of one of college basketball’s most memorable coaches, Lou Carnesecca. Now St. John’s is not just about its former coaches, it is about its current coach. 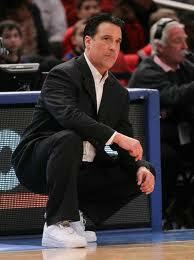 Steve Lavin has brought his own fashion flair, substance and coaching style to the Red Storm. Most notably his signature look of Air Force Ones and the tie-less suit. Want to look like you own the collegiate basketball scene? Get yourself a fresh white pair and make sure you leave your older brother’s tie at home (No need to tell anyone you don’t own a tie or know how to tie it anyways). Since St. John’s underwent an amazing renovation at Carnesecca Arena which put the student section directly on top of opposing free-throw shooters, students have enjoyed being a giant factor in the game. 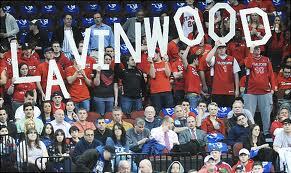 One other thing that the student section has brought in is the invention of “Lavinwood.” Being from UCLA while having a larger-than-life presence the letters L-A-V-I-N-W-O-O-D are often prominently displayed at either Carnesecca or MSG. While some of the new traditions at St. John’s have become a staple, one tradition that will not go away any time soon is the Red Storm’s (or previously the Red Men’s) signature chant: We Are… St. John’s. Whether STJ is trying to get trying to get back in the game or are up by 20, the student section as well as all of St. John’s die-hard fans know that as soon as they hear “we are,” the proper response will always be… ST. JOHN’S! As always please continue to vote for me at MyBigEastVolvo.com, follow me on Twitter.com at handle @BIG3Sports and like the Facebook.com/Gambo4VolvoBiggestFan. Yea Johnnies! The Lavinwood letters are hysterical. Love the black jerseys too! Although I’m not to sure of the ugly sweaters. That is Lou’s look to himself!